Now with a new, updated layout and cover, the extremely popular journal All About Us is a powerfully revealing book for couples, filled with thought-provoking questions to capture relationships in a meaningful yet fun way. 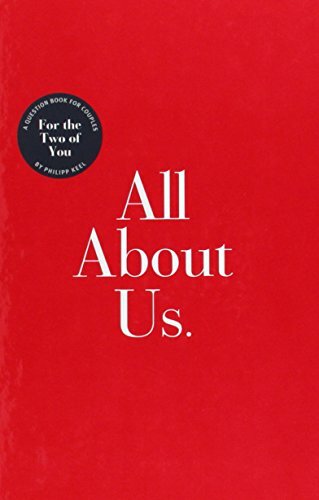 All About Me has given thousands of readers insight into the thoughts, feelings, and events that uniquely shape their lives. Now Philipp Keel has created an even more personal collection of fascinating questions--a fun, non-threatening tool designed to help couples deepen their relationships. Unlike dry record books that merely account for dates and names, All About Us gets to the heart of the matter by asking the questions that partners may be desperately curious about but hesitant to bring up, such as: If you could change one of your partner's body parts, what would it be? You have drawn blood in a fight with an ex (yes/no). Name a habit of your partner that you have proudly accepted.